Simonit&Sirch go to Château Latour and Moët&Chandon. After Château d’Yquem, other prestigious French “Maisons” ask for the counselling from the group led by Marco Simonit. Simonit&Sirch, the Pruning Guys, go to Château Latour and to Moët&Chandon. 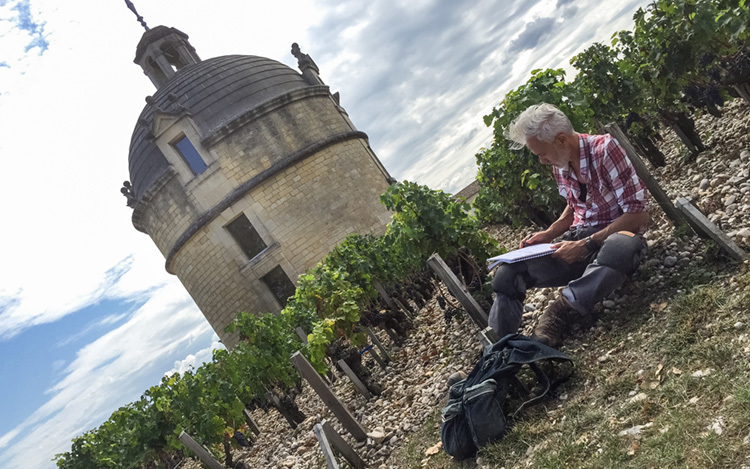 After Château d’Yquem (the most precious white wine, the legendary Sauternes, the only one with the title of Premier Cru Supérieur), Marco Simonit and his team of experts have been called to protect the health of the vineyards of two other famous French Maisons: Château Latour, Premier Grand Cru Classé, one of the most prestigious and valuable wines of the world (a bottle of 6 litres from 1961 was auctioned at Christie’s for £ 135.000) and Moët&Chandon, one of the world’s leading champagne producers. Château Latour is to Bordeaux what Chateau d’Yquem is for Sauternes: the perfect inspirational model. It is situated in one of the most glorious denominations of the area of Médoc: Pauillac AOC. Its history started around 1670, but the vine cultivation around the watchtower, from which it takes its name, built by the English in 14th century, probably dates further back in time. The name of Chateau Latour has seen a rapid raise in its popularity during the 18th century, with the exports to England and its success with the royal court. The current owner is the businessman Francois Pinault. Moët & Chandon has a long tradition of achievements, primacy and pioneering and legendary innovations, that have made Moët & Chandon simply the most famous Champagne in the world. Established in 1743, the maison in Épernay owns approximately 1200 hectares of vineyards and produces annually more than 32 million of bottles of Champagne. It is part of the Group LVMH, world leader in luxury goods. Those famous wineries – like the other Châteaux and the French giants of good quality wine, like Roederer, for which the Pruning Guys have worked as consultants for a long time – need to protect their most precious asset: their vineyards threaten by deterioration and premature mortality, due to trunk diseases. “In the area of Bordeaux –Marco Simonit says – the deterioration of the vineyards is an endemic, very severe problem, causing the death of 10% of the Cabernet Sauvignon plants every year. Without an effective treatment against trunk diseases (including esca and many others), Château Latour has decided to invest on prevention and has contacted us as consultants. We can offer a method, perfected in years of work and experimentation, aimed at making the vines less vulnerable, with a more solid and efficient wooden structure. This is achieved thanks to a pruning designed for reducing the devastating impact that cuts have on the sap system of the plants. We have studied the traditional training of Cabernet Sauvignon (Guyot du Médoc); we have tried and understand its weaknesses and then we have identified less invasive pruning techniques, which are innovating and respecting the tradition at the same time. Clearly, we share all these steps with the management and the local technicians. We mostly work on young vineyards as well as on undamaged adult ones, when training the pruning teams. Our ultimate goal is to codify an innovative pruning system in the next 5 year, tailored specifically to Château Latour. We will evaluate with them possible modifications to be implemented, always respecting the tradition”. The same philosophy is applied by the Pruning Guys in the Moët&Chandon vineyards, where they are studying pruning techniques built on the traditional approaches for Champagne (the Chablis system for Chardonnay and the Champagne spurred cordon for Pinot Noir) with the aim of extending the lifespan of the vineyards, which – with a 4/5% mortality – are less vulnerable than Bordeaux. “Extending the lifespan of the plants as much as possible, is indeed a priority for the big Maisons, since this ensures the continuity of their quality and makes their wines recognisable”, Marco Simonit explains. “We have started working with Moët & Chandon, in 2013, in three areas: Val-de-Marne, Montagne de Reims, Côte des Blancs”. More prestigious consultancies in France and Italy. This year in France other 7 important and well-known Maisons have entrusted to the Pruning Guys the training and tutoring of their pruners: Premier Grand Cru Classé Château Ausone, Grand Cru Classé Château Pape Clement, Château Carbonnieux, Château Yon-Figeac, Château de Fieuzal, Second Grand Cru Classé Château Rauzan-Gassies, Quatrieme Grand Cru Classé Château Marquis de Terme. These join the 17 Maisons that our group already assists in the Bordeaux region, Champagne and Provence. Over 130 companies in Italy and abroad have chosen as consultant our dynamic group, unique in the international scene, with qualifications from universities and research institutes. Prestigious Italian wineries, Allegrini, Anselmi, Nino Franco, Colle Massari and the Zonin Groups (including the branch in Virginia) have recently started a collaboration with the Pruning Guys.